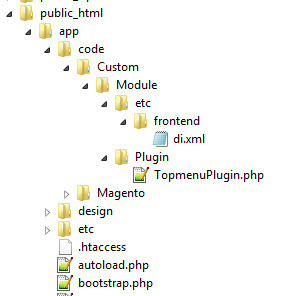 Is there a way to create a custom menu item in the magento 2 Top menu which links to an external URL. Static page only category doesnt suit my need because I just want to redirect the user to a different website. Update: I tried with the plugin as suggested and it doesn't come. I cleared the cache too. So, after the Topmenu Block generates its html, we intercept it and add our new menu items. Here you have one top menu item with 3 sub-items. Simply replace the "REPLACE_BY_YOUR_EXTERNAL_URL" by your urls and the "REPLACE_BY_THE_TITLE_OF_THE_LINK" by the title of your links. Not the answer you're looking for? Browse other questions tagged magento2 topmenu or ask your own question. How to Hide Header(Primary) Menu before login (for Visitors)?